Panch Prayag is the holy journey followed by the devotees in order to seek condolence from their sinful life and peace for their mind and body. Prayag is defined as ‘Confluence’. Here, Panch Prayag commemorates the confluence of five holy rivers that are considered sacred in Hinduism. People believe in taking bath in the rivers before worship; or performing Shraddha of their ancestors or even worshipping the holy rivers. Uttarakhand, the holy abode of Gods is known for offering the most religious locale to the pilgrims hailing from all around the world. It is popularly known for its holy shrines that are known for providing solace and contentment to the pilgrims from a deteriorated state of mind. Panch Prayag is the holy journey carried down by the devotees in the Gharwal Himalayas of Uttarakhand State that takes the pilgrims onto the path of sanctity and tranquility. Panch Prayag takes the devotees to the great and sacred confluences of five holy rivers that are revered and worshipped by the pilgrims on their visit to the numerous holy shrines. These confluences are the major centers for the pilgrims where they perform the purification process and also prayers to the associated deity. Every year, millions of devotees head to the holy abode of Gods, the state of Uttarakhand to discover the everlasting divinity of the holy confluences of these sacred rivers. What Hindu Mythology Has to Say About Panch Prayag? Panch Prayag formation leads to the formation of River Ganga, the holy river that descends on the earth to depart salvation to the mankind. This is done when River Alaknanda meets the Bhagirathi River after flowing through the other four confluences of Panch Prayag i.e. Vishnuprayag, Nandprayag, Karnaprayag and Rudraprayag. After meeting with the Bhagirathi River at Devprayag, the river takes the form of sacred river Ganga. Our Hindu mythology had a detailed theory behind the evolution of River Ganga that states the phase during which River Ganga started descending the earth to cherish the mankind and their poor soul. The historical embodiment of Panch Prayag beholds the story behind the arrival of Goddess Ganga on the earth after King Bhagirath meditate to Goddess Ganga to come down on earth and free his ancestors from all their sins. Goddess Ganga was powerful and so as to control the force, a division into 12 channels is propounded. Devprayag which is the higher among the Panch Prayag is the birth place of river Ganga on earth. 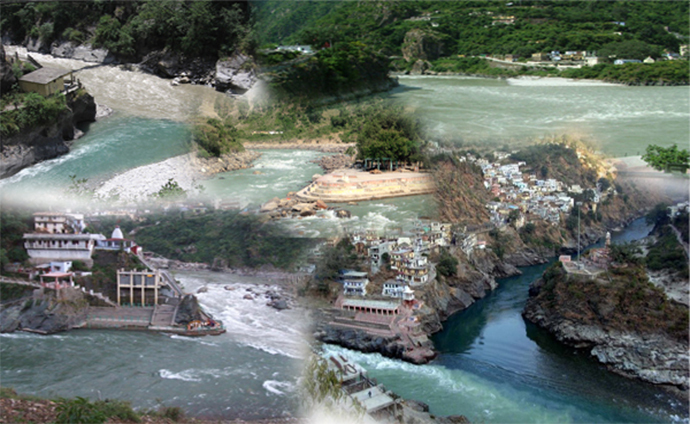 Panch Prayag is the places where confluence of different streams of Ganga takes place at five different places. Alaknanda River meets river Dhauli Ganga at Vishnuprayag, then she meets Nandakini River at Nandaprayag. From there, she moves to create Karnaprayag after uniting with river Pindar and then heads towards Mandakini River to form Rudraprayag. At last, she mixes with Bhagirathi River at Devprayag from where the sacred river Ganga formed up. Devprayag is the most revered and pious confluence that gained acknowledgement as the birth place of River Ganga. It is the meeting point of Baghirathi River and Alaknanda River that when merges forms Ganga. The merger or sangam takes place when Baghirathi River rises from Gaumukh and Alaknanda river rises from Satopanth Glaciers nestled near the Chaukhamba peak and they both meet at a point known as Devprayag, from where the river Ganga emerges. Rudraprayag is another confluence among the Panch Prayag that showcases the meeting of Alaknanda River with Mandakini River. The sangam of Rudraprayag takes place when the bright green Mandakini River that hails from Kedarnath gets along with the white Alaknanda River hailing from Badrinath. Out of the Panch Prayag, Karnaprayag displayed the meeting point of River Alaknanda and River Pindar. For the broad sangam, river Pindar originates from the Pindari Glacier and meets up with River Alaknanda. As per the legendary sources, Karnaprayag beholds the story of Karna, the son of Lord Surya and Kunti, how he meditated in this location and granted with the kundal, tuner and Kavach that made him unbeatable. The confluence at Nandprayag formed up after green Nandakini River that hails from Nanda Devi Glacier gets blended with river Alaknanda. At this sangam, the two rivers meet and flow from here together. According to Hindu mythology, the prayag was earlier known as Kanvasu, after the name of renowned sage Kanva. Later on, King Nand performed Maha Yagna at this point and then it was named Nandprayag. Among the Panch prayag, Vishnuprayag is the fifth and the last prayag of Gharwal region. The sangam at Vishnuprayag beholds the meeting of the Alaknanda River with Dhauli Ganga that hails from the Niti Valley. Panch Prayag Yatra is a complete journey that purifies your mind, body and soul. Taking a Panch Prayag Yatra will take you to the land of spirituality and contentment and encompass you with the purified feeling of freedom from all your sins.